**UPDATE: I just bought two through uPromise. I did not double dip. I want to see if I will get rewards points and uPromise cash back. If I get both the cash back and the points I will probably buy two more before the deal is over and try to double dip. **UPDATE: See this is the nice thing about journaling, you learn with me. Double dipping was killed awhile ago. Man I wish I got into this reselling thing sooner. I am really enjoying these iPad sales. 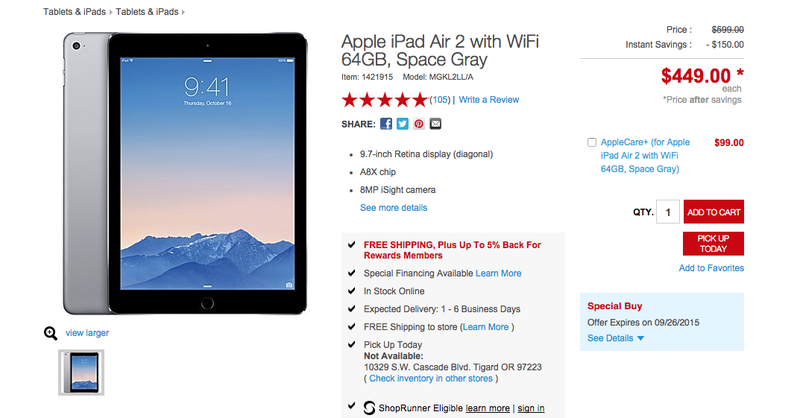 Staples has a promotion running until September 26, 2015 for $150 off iPad Air 2s. This presents a pretty good reselling opportunity. Straight up here is how the deal breaks down. Straight up that is a pretty good reselling opportunity. However, I see a couple of options to make the deal even better. Cardpool.com currently sells Staples gift cards for a 6% discount. That is a savings of $26.83. Under option 1 your profit would increase to $82.91. Not too shabby. Currently uPromise is offering 5% cash back on purchases made at staples. What if you bought a gift card at Staples for $449. You would get $22.45 in cash back from uPromise. The big question then becomes can you double dip? That is can you go back through the uPromise Portal and purchase the iPad with the gift card with another 5% cash back? If you can, that would be another $22.45. Now you are looking at a profit of $109.98. This of course is the ideal scenario but I think there are two potential road blocks worth mentioning. 1. Can you double dip? I’ve heard of people being successful double dipping through portals so it’s possible. 2. Will uPromise give you cash back when acquiring Staples Rewards? I had an issue awhile back where I bought something at Best Buy via uPromise. Later I noticed that I earned Best Buy points but not uPromise cash back. Portals can be glitchy but I wonder if uPromise won’t give you cash back if you are also earning rewards through a store’s loyalty program. So a couple of things to keep an eye on but I think this deal is still worth experimenting with. Be the first to comment on "$150 Off iPad Air 2 at Staples – Potential $100+ Profit"